Winning the order ... using the Sales Manager in Allplan Precast! When tendering for a project, precast companies often have to rely on floor plans or basic models provided by the client. The Sales Manager enables you to put your calculation on a secured basis in a quick and efficient way and to underpin your quotation with nice visualisations. 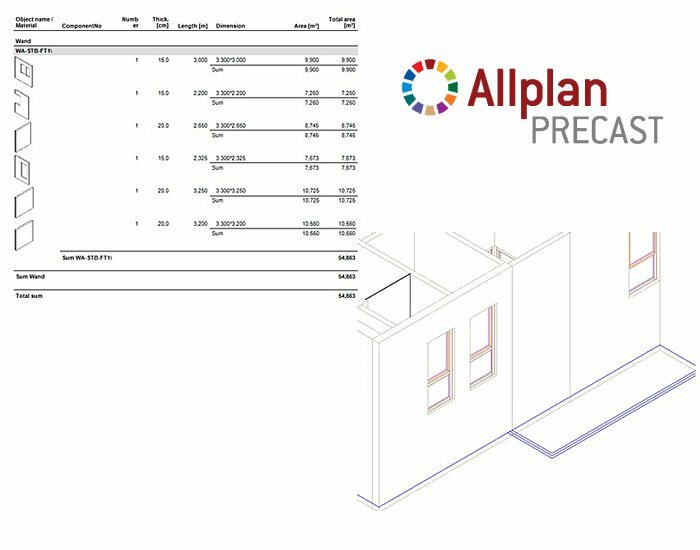 Firstly, you drag & drop the plan (mostly PDF/DXF/DWG) to the Allplan drawing area. Thereafter you use the graphically oriented Assistants to design intelligent 3D objects – quickly and easily. The assistants need to be configured only once to contain all your products including the necessary calculation base. In your daily work you only need to choose from the existing options and enter some parameters – e.g. dimensions. No CAD know-how is necessary in this! For the configuration and implementation of the assistants including all company- and product-specific parameters, the Nemetschek Engineering precast experts offer their consulting services. Now, you get a 3D model that will bring you numerous benefits: You can determine volumes and masses, create lists and reports and transfer data into your calculation software. Take for granted: models and lists are always consistent within themselves – if you modify the model, the lists will be updated automatically. Quickly, easily and flexibly you can respond to any emerging changes and adapt your quotation, if necessary. The result is the accurate list of your scope of supply and services, and you can include also graphical representation of individual components. From the beginning, there is clarity about each item – for your customer and for yourself. A distinct advantage in tenders and very useful factor when the final bill is to be prepared! In addition, the Sales Manager offers complete visualisation that can be sent to your customer as a 3D PDF: One picture is worth a thousand words…! Clarity, transparency and better communication are other positive side-effects of using the Sales Manager for the preparation of proposals. Our customers Con-Form AS have been using Allplan Precast for a long time – their conclusion: “The offer winning the order”!